Engagement scoring is a way to stack rank people that attend your event in different business segments. This can be used to fuel sales and marketing activities, persona mapping or account and campaign validation. 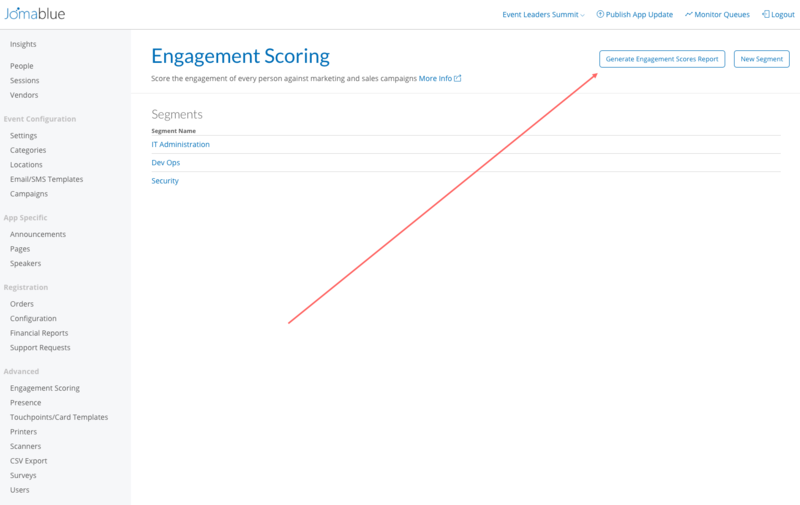 To setup engagement scoring, you first need to consider how you want to segment your data. Most commonly, segmentation occurs by business unit or product line. With these three segments you can create scoring models that measure how active someone is in that segment and rank them against other attendees. I have set up Segments, now what? You can see a person's progress at anytime by looking at the person record and navigating to Engagement Scoring. The chart is displaying how much of the segment a person has completed. In other words, out of all the possible points a person could obtain, how many has this particular person achieved. In this case, the person has obtained 100% of the possible points in the Security segment, while only a small percentage in the other two segments. 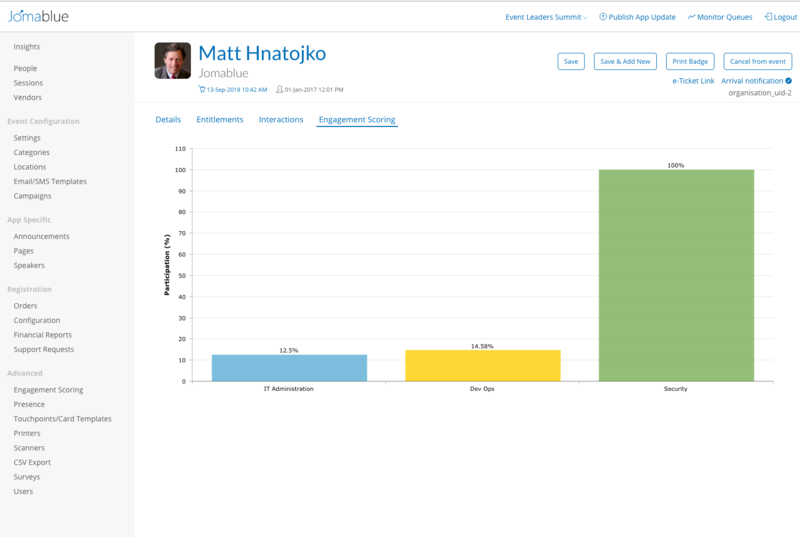 Within engagement scoring, you can generate an Engagement Scores Report. This may take a while to generate based on the number of people in the event and the complexity of the scoring models. The first 12 columns are static. They also include Organisation_uid and QR UID as unique references for look-ups if used in conjunction with other reports. After column 12, the categories in the event are included. A Y will appear if the person is in that category. Category columns start with CAT000 followed by the category name. eg: CAT001 Staff and CAT002 Delegate. For each segment there are two columns. There is a score and a participation percentage.